Consumers apparently would much rather buy their office supplies online. Office retailer Staples has not only emphasized online sales more in recent years, it's finding its brick-and-mortar stores are less profitable. After reporting disappointing earnings late Thursday, Staples announced it would close 70 of its North American stores. It shuttered 48 locations last year. But it isn't just a matter of consumers preferring to buy their printer toner from the Staples website. Consumers are increasingly turning to the competition. Staples reported that total company comparable sales for the fourth quarter of 2016 fell 1% year-over-year. The company earned a profit in the fourth quarter, just not as much of one as Wall Street analysts expected. 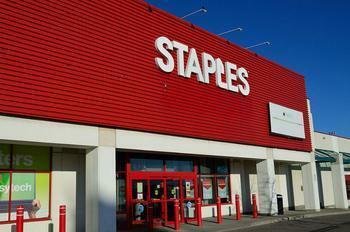 In fact, delivery was one of the few bright spots in the Staples quarterly results. The company has been promoting its online sales to both business and consumer customers. But it has plenty of competition there, including Amazon.com. To bolster its defenses, Staples attempted to acquire rival Office Depot in late 2015, but was turned aside by federal regulators last year. In challenging the proposed merger, the Federal Trade Commission (FTC) asserted that a union of the two retailers would have allowed Staples to dominate the office supply market. Staples had argued that there is plenty of competition from online retailers, and that it needed the merger to compete.